Delaware County customers have plenty of options when it comes to auto repair. 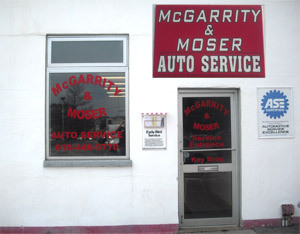 However, McGarrity & Moser is a full service auto repair shop offering top of the line service at competitive prices. We’ve also been serving Delaware County for over 60 years and have built a reputation as a reliable service. For full descriptions of these services, visit our auto repair services page. On most parts and labor, we offer a 12 month or 12,000 mile warranty. Our team performs repairs on all makes and models, and even works on trucks. Our team is equipped with the latest technology to handle and make the right diagnoses on computerized vehicles. We can even perform PA state inspections. Our Havertown location makes us a convenient spot for virtually any Delaware County auto repair customer. Our repair shop is open weekdays between 7:30 am and 5:30 pm and is furnished with a comfortable sitting area and internet access. Give us a call at 610-446-5770 to make your appointment today.